McCormick-Deering.Com: IHC Tractor Gray Paint Discovered! A few years ago, I came across an item for sale that caused my pulse to quicken and my spine to tingle. 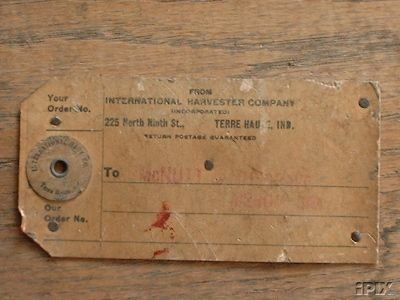 Someone had discovered two gallons of International Harvester Company Tractor Gray Paint, stock #1063 and offered them up to the highest bidder on eBay! I thought to myself, "My wife is gonna kill me, but I have got to have this paint." After all, I have been looking for it for the past thirty years. 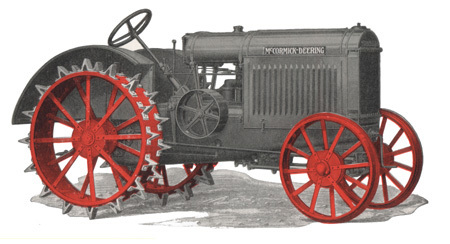 Early model McCormick-Deering tractors were originally painted gray with red wheels. In fact, all model 15-30’s and 22-36’s left the factory in these colors. On November 1, 1936, International Harvester discontinued the use of tractor gray moving to an all-red color scheme, after the 15-30 / 22-36 models had ceased production. The wind driven dirt and sand, a much needed thunderstorm, snow cover on a winter wheat crop, and the bright, intense heat of the summer sun made quick work of stripping and fading the decals and factory finish from these mechanical work horses. Most farmers repainted their 15-30 / 22-36’s using only International Harvester Red for better road visibility. By the time my Granddad bought "Old Wes", a 1929 Model 22-36, in 1968, the red paint was wearing thin and some of the original gray was showing through on the fuel tank and hood. I had only recently begun to understand that the 22-36 tractors we used to farm with every summer were "antiques". As my interest piqued, I started gathering up original parts as I came across them. "Old Wes" had an original gasoline/kerosene carburetor and the old E4A International magneto on it when we bought it. When Gramp updated it, I put the original parts away - in fact, when I restored it, the original carburetor and magneto went back on it. This brings me back to my search for IHC Tractor Gray. I needed to know the color to complete my restoration. I wrote a letter to International Harvester in early 1969 asking about the original gray paint, also asking for drawings of the decals used on the 22-36. I didn’t get an answer on the paint, but did get copies of some decal drawings. Not satisfied, I called IH and asked the customer service department about Tractor Gray #1063. I was told (believe it or not) that the best thing to do would be to mix a gallon of white and a gallon of black and it would be close to a match! The mystery of the actual gray color continued into the 1980’s, with no one color being universally accepted as the authentic IH gray used on these tractors. Some restorers were using DuPont ™ 98620-D enamel, while others were using 97625-D . DuPont ™ 98620 was much lighter and had a slightly green tint to it, while 97625 was almost charcoal. My quest for the actual color took a promising turn when I found a New Old Stock stub fender in an old granary near Bucklin, Kansas. Comparing DuPont ™ 97625 to the fender, I decided that it was the closer of the two DuPont ™ colors, and was a reasonably good match. In 1983, I began working with IH Customer Service to provide reprints of out-of-print owner’s and overhaul manuals. While speaking with Sue Otten, IH’s nationwide Customer Service Manager, she asked me if I had made any progress on the paint issue. I told her my story and that I thought 97625-D was the closest match that I’d seen. Subsequently, IH started recommending the prescribed DuPont ™ formula to restorers of these antique tractors. At last, the issue seemed to be settled! Every now and then someone would come to me, having seen one of my restorations, and remark that they thought the color was off - maybe too dark, or maybe it didn’t have enough blue in it. I began to think that I may not ever really know the actual, factual formula to arrive at IH Tractor Gray. Then in 1985, another clue fortuitously presented itself. In conversation with a friend and fellow-restorer, he told me he had a half-gallon of IH gray paint that his grandfather had purchased to repaint a 10-20 but had never used it! Eureka! I have found it. He believed the paint was still good and I asked him for a small sample to have it analyzed. Although he agreed to provide the sample, it never happened. Over these many years I continued to pursue him about it - even as recently as six months ago. He told me he still had the paint, and again offered to provide me a sample of it. Nothing ever came of it. And then, the elusive IH Tractor Gray was up for bid on eBay! The paint was found in old garage in Connecticut that had once been an International Harvester dealership. 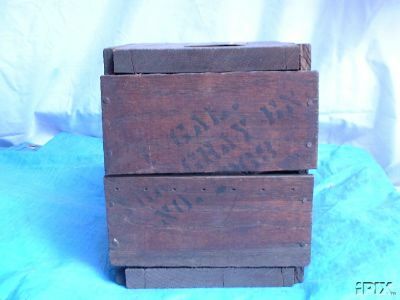 One gallon was in a cardboard box, and the other was in an oak shipping crate with a label on it indicating that it had been shipped from the International Harvester Company branch house in Terre Haute, Indiana. Neither gallon had ever been opened! 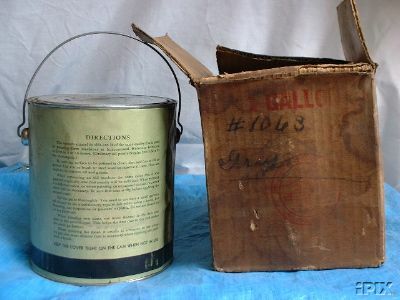 The paint had been advertised as "Paint Cans, good for memorabilia purposes" - assuming it to be highly unlikely that the paint could be any good seventy years or more after being manufactured. I wrote to the gentleman who was offering the paint, and asked whether or not he could tell if the paint was still liquid. He shook the can and wrote back. To my thrill and amazement, he told me that BOTH gallons appeared to still be liquid! With the bidding being hot and furious, I eventually emerged as the proud owner of two gallons of (very expensive) IH Tractor Gray Paint - stock #1063. The paint was carefully packaged and shipped halfway across the United States. I cannot begin to describe what I was thinking as I opened the packages. There inside, carefully wrapped, were one boxed and one crated gallon of paint that I had been trying to find for over 30 years! The label of the boxed gallon carried the older I.H.C. insignia, which had been discontinued in 1945, and indicated that the paint inside was Tractor Gray - that which had been discontinued in 1936. I shook the can. The liquid sloshing inside was music to my ears. I shook it by hand for ten to fifteen minutes, removed the label from the boxed gallon, and then removed the sealing clips from the lid. After a great deal of prying, the lid finally came up,and I used a wooden stirring stick to check to see how much pigment had settled to the bottom and hardened. Although there was some settling, the paint had not hardened at all! I used the stick to thoroughly remix the contents of the can, and then used a clean tube to draw out a sample of the paint, which was placed in a small glass bottle with a lid. I then re-opened a can of DuPont ™ 97625 Gray paint that I had recently used to touch up a 1936 WK-40 that I had restored, stirred it thoroughly, and drew a like sample from it. I hope to soon have pictures of the two samples posted here. To see the two colors side-by-side, it is easy to see that DuPont ™ 97625, which has been used as the standard for IHC Tractor Gray since the 1980’s, and the original IHC Tractor Gray Paint, stock #1063, are distinctly different. I am in the process of researching the original IHC Tractor Gray to see if the original formula may yet be found. In the meantime, I have sprayed the upper radiator tank of a 1927 McCormick-Deering 15-30 with a small quantity of the ORIGINAL paint. It still mixes and sprays beautifully. Spectrum analysis has been done on the painted surface of the radiator tank, and a formula has been recovered from the spectrum analysis. This formula is guaranteed by DuPont ™ to be an exact match of the paint applied to the radiator tank. The 1927 Model 15-30 tractor featured on this site in the Projects area will be painted with the now opened gallon of IH Tractor Gray. This tractor is a unique find in it's own right. The finishing of this treasure with original paint is a fitting tribute to a truly original piece (see related story). Imagine... original tractor gray from a can that has remained unopened until this year. This gallon of paint dated back to at least the early 1930’s. The oak-crated gallon will remain unopened for the time being. I want to preserve what may be the last of it's kind. Maybe, just maybe more may be discovered. But the chances are slim. 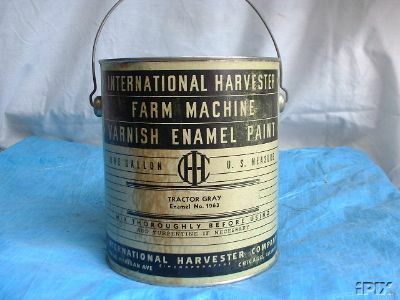 Until then, McCormick-Deering.Com will soon be offering quality reproduction IH Tractor Gray paint. The label from original gallon will be reproduced, the paint mixed from the DuPont ™ certified formula, and then offered exclusively through McCormick-Deering.Com. Keep checking back to see when this item will be available. To my fellow restorers and enthusiasts of early McCormick-Deering and International tractors - the mystery of IH Tractor Gray has finally been solved! Your personal farming and restoration stories are really nothing less than history. Please share them with others by emailing them to us. Attach any photos that help tell the story and you might find them on this site.